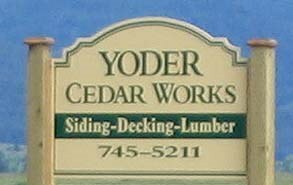 Yoder Cedar Works is approx. 45 minutes north of Missoula, just minutes north of St. Ignatius, MT east of Hwy 93. We are just 30 minutes south of Polson. Just north of St. Ignatius, take the main street exit, then an immediate left onto Airport Rd. Yes, you will pass the airport. Go east approx. 2 miles to Hillside Rd, and take a left. We are located on the right. If you reach the corner of Allison & Hillside roads, you went too far.